From a game design standpoint, the Uncharted games are not the greatest games in the world. It’s gameplay has been done better elsewhere, in the likes of Assassin’s Creed and action-shooter hybrids like Mass Effect and Gears of War. It’s not even the most seemless action-gaming experience like God of War. And yet, Uncharted 3, just like the two previous iterations, is one of the most fun, rewarding action-gaming experiences I’ve ever had whose actual enjoyment blasts it past most of those previously mentioned games as an overall experience. It’s funny how hard it is to describe the quality of the series. Not only do the Uncharted games *not* introduce anything particularly novel in terms of gameplay, you could argue that there is an actual lack of it as there is only just enough gameplay to complete the game’s plotscenes and then you’re done. The game is almost *all* quicktime events. Every aspect of its gameplay is individually beaten by other games. And you could argue that the Tomb Raider games did all the plot-events already. And somehow, Naughty Dog has taken individual elements that aren’t quite as good and interwoven them with amazing, jaw-dropping set-pieces and perfectly timed plot-pacing to create the greatest movie ever played (and I emphasize the word “played”). Yeah, there are cutscenes, but so much of the game happens in breakneck-paced playable events that take place in cinematic camera style that Bruckheimer and Spielberg themselves couldn’t pull off. And did I mention the art behind the set-pieces? Enormous. Gigantic. Stupendously gorgeous. There are parts of this game, just like some parts of the previous games, where I put down my controller and just stared. It helps that Nate Drake is an easy protagonist to like, follow, and represent. Yeah, he’s another proto-80s-Harrison-Ford-role. Yeah, he’s not that complex, or even that fleshed out. It doesn’t matter. Naughty Dog did the smart thing; they went out of the way to make sure that Nate has one single, solitary, character aspect that truly makes him stand out: he is a thief, not with a heart of gold, but a heart of wonder. Those bits where I put down my controller just to look? If you’ve ever played Uncharted, you’ll know what I mean when I say it feels like Nate Drake was sitting there, staring in awe with you. 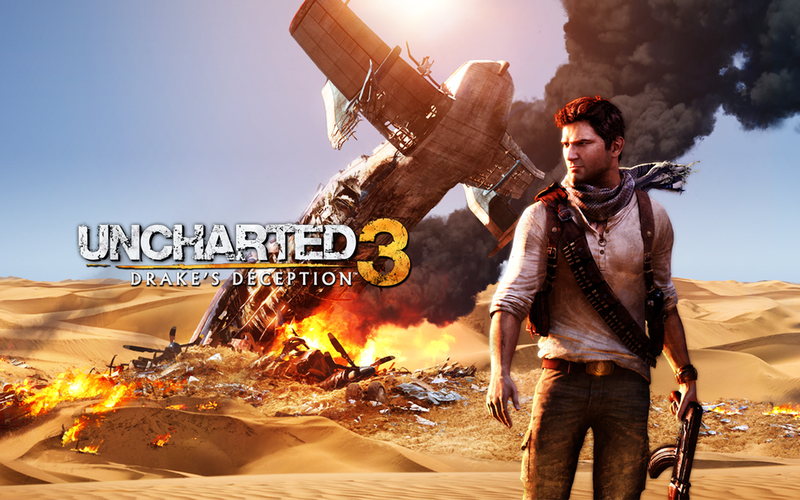 Somewhat ironically, Uncharted 2 is actually a better game than 3, plot-wise. Its background plot was ever so slightly more interesting, the urgency just a little bit higher, and the villains of 2 were actually diabolically out there and awesome in their own right. While Naughty Dog tried to humanize their villains this time, it just doesn’t quite work, and they’re not crazy enough to be characters, if you know what I mean. Still, it feels like a minor quibble. The plot is so impressive, and the action so tight, and the set pieces so awesomely huge, that they could have called this game Indiana Jones Had a Kid Who Isn’t Shia LaBeouf and I would consider it a compliment. To Indiana Jones.